We believe we're the first B&B in the UK to offer this service. We now have POI files, (Points of interest files) that you can download into your Sat Nav before your stay with us. Not only does this give you the correct location of Pottery House (as our post code is a little misleading on SatNavs) but also loads of places to visit during your stay and places to eat out. Our POI files also includes proximity alerts (similar to the warnings for speed cameras) so that as you drive around the area your Sat Nav will tell you about thinks to look out for and points of interest. Despite a light covering of snow here this morning, and some strong and chilly winds over the last couple of days, the first daffodill of spring is this morning starting to open. 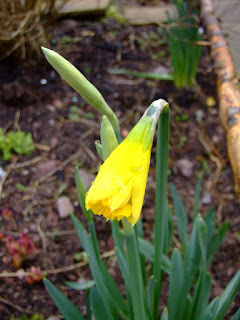 As well as the full sized daffodills, the minature daffs are also starting to open. As a keen gardener I love this time of year when seeds are sown for the summer flowers and are starting to germinate. 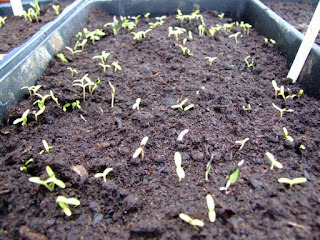 The earliest seeds were sown in the greenhouse at Pottery House about 10 days ago and already they are starting to show.